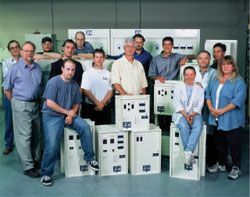 Power Systems Calgary | About Us | Hayley Industrial Electronics Ltd.
Hayley Industrial Electronics Ltd. is a family run business based in Calgary, Alberta. Hayley was founded in 1978 by Noel Hayley, who currently runs the administrative side of the business as President. 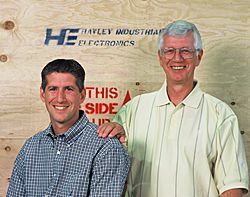 Noel's son, Darrell, began working at Hayley Industrial Electronics Ltd. at a young age and now oversees the manufacturing operations as vice-president. Both Noel and Darrell share the same vision of producing only the finest product available. The staff and management at Hayley Industrial Electronics Ltd. take great pride in knowing that they produce the best, most reliable UPS systems in the industry. "We’re not aspiring to be the largest UPS systems manufacturer in the world… just the best." Since our inception in 1978, Hayley Industrial Electronics Ltd. has been committed to delivering an operational environment where equipment damage, data loss and operational interruptions resulting from power issues were a thing of the past. Every step in our development has been guided by our commitment to protecting our client's ability to work worry free. We continuously look for new ways to expand our products and services to better serve our customers.